Charge a new USB-C smartphone and a USB-A device simultaneously with this 2-port, 27 Watt wall charger that features two fully-powered independent ports. One 15 Watt port delivers fast, optimal charging to your USB-C smartphone, while a second port guarantees 12 Watts to your USB-A device for fast charging. As the world moves towards USB-C, this 2-in-1 charger shows a commitment to new technology, without leaving legacy devices behind. The charger’s 27 Watt total output is split between the USB-C port and the USB-A port. With USB-C devices capable of using more power to charge faster, this helps to deliver optimal charging for all your devices. 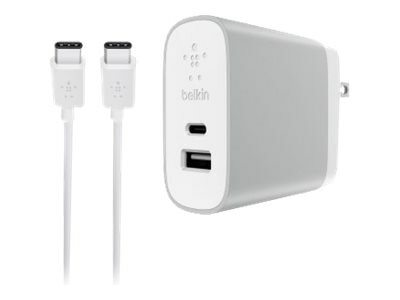 This means a USB-C device can draw a guaranteed 15 Watts from the charger if required, while a USB-A device can draw up to 12 Watts from the charger simultaneously. Dedicated, independent power allowances ensure fast, safe charging for old and new devices alike. A dedicated 15 Watt USB-C port ensures optimal charging for USB-C smartphones – up to 50% faster than 5 Watt charging. A 6ft high-quality USB-C to USB-C cable is included to make the transition to USB-C even easier. The charger also offers standard charging for larger USB-C devices such as tablets. The reversible USB-C port allows for easy connection as it’s impossible to plug in upside-down.